Pope Leo XII granted permission for the erection of altars and churches in her honor. Pope Gregory XVI authorized her public veneration, and named her patroness of the Living Rosary. The cure of Pope Pius IX, while archbishop of Imola, was attributed to Philomena; in 1849, he named her patroness of the Children of Mary. Pope Leo XIII approved the Confraternity of Saint Philomena, and raised it to an Archconfraternity. Pope Pius X raised the Archconfraternity to a Universal Archconfraternity, and named Saint John Vianney its patron. Saint John Vianney himself called Philomena the New Light of the Church Militant, and had a s trong and well-known devotion to her. Others with known devotion to her include Saint Anthony Mary Claret, Saint Euphrasia Pelletier, Saint Francis Xavier Cabrini, Saint John Nepomucene Neumann, Saint Madeline Sophie Barat, Saint Peter Chanel, Saint Peter Julian Eymard, Blessed Anna Maria Taigi, and Venerable Pauline Jaricot. In 1802, the bones of a female between the ages of 13 and 15 were discovered in the catacomb of St. Priscilia. An inscription near her tomb read "Peace be with thee, Philomena", along with drawings of 2 anchors, 3 arrows and a palm. Near her bones was discovered a small glass vial, containing the remains of blood. 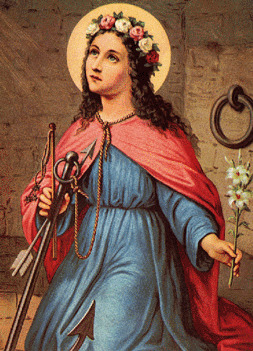 Because it was a popular custom of the early martyrs to leave symbols and signs such as these, it was easily determined that St. Philomena was a virgin and a martyr. Her popularity soon became widespread, with her most memorable devotees being St. John Vianney, St. Madeleine Sophie Barat, St. Peter Eymard, and St. Peter Chanel. After being miraculously cured, Ven. Pauline Jaricot insisted that Pope Gregory XVI begin an examination for the beatification of St. Philomena, who was to become known as the "wonder worker". After hundreds of other miraculous cures, she was beatified in 1837. St. Philomena, who the pope named as the Patroness of the Living Rosary and the Patroness of the Children of Mary, is the only person recognized as a saint solely on the basis of her powerful intercession, although pertinent revelations regarding her life have been recorded. Her relics are now preserved in Mugnano, Italy.